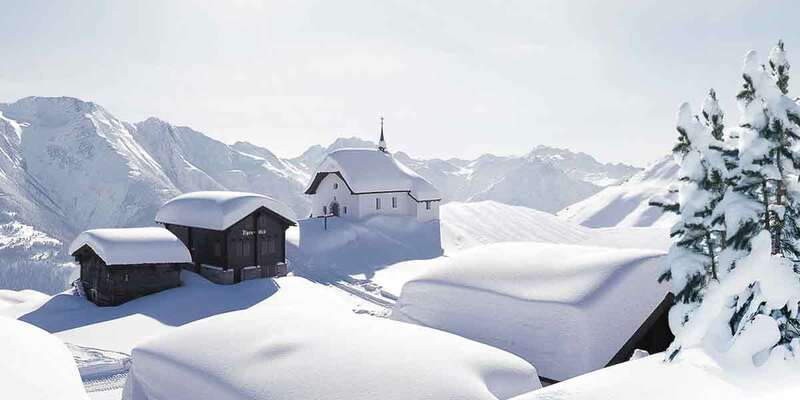 Plan your Switzerland ski holiday with Estours Travel. Contact your Europe ski holiday experts at Estours Travel. Below is a selection of famous Swiss ski areas together with suggested hotels. Fill in the quote form and send to Estours Travel to start planning your Switzerland ski holiday now. Switzerland’s most famous resort brings together every Alpine cliché, from its views of the world’s most photogenic mountain, the Matterhorn, to its narrow streets lined with wonky, weathered chalets. Surrounded by 38 summits above 4,000m, the car-free town is full of life all year round. As a ski destination, especially for families, intermediates, experts and ski tourers, Zermatt sits up with the best. It has snowsure slopes from late November to the end of April, making it a wise early and late season choice. Several high altitude top stations (up to 3,820m), 350km of pistes facing all aspects (counting the linked resorts of Cervinia and Valtournenche in Italy), a slick lift system that improves every year, extensive off piste, outstanding mountain restaurants and a buzzing, cosmopolitan town all serve to make it a cut above. The resort itself extends more than two miles along a valley half a mile across. Most shops, restaurants, bars, cafés and hotels are gathered around the attractive main shopping street, Bahnhofstrasse, which runs up the valley from the train station. The River Vispa flows parallel, a few blocks away. Strolling around the car-free town is a pleasure, though there are bicycles and electric buses and taxis to watch out for. For those driving to Zermatt, cars can be parked 5km away at the village of Tasch – the resort is then reached via a shuttle service. At all times of day – and, indeed, year – there’s a busy, prosperous feel to Zermatt’s centre, with ambling fur-coated couples and Japanese or Chinese tour groups rubbing shoulders with purposeful mountaineering types. The three lift stations are the Gornergrat railway (next to the main railway station), the Sunnegga funicular a couple of hundred yards away on the far side of the river, and the Furi gondola, more than half a mile from the station. Situated in the Bahnhofstrasse in car-free Zermatt, the family friendly Hotel Schweizerhof offers you fine Swiss cuisine, a wellness area with a pool, concierge service and free WiFi. Most rooms and suites at the Schweizerhof have a balcony providing stunning views of the Matterhorn mountain. There are 2 restaurants in the Hotel Schweizerhof during winter season and Dine Around is offered in cooperation with 11 further restaurants. The railway and Gornergratbahn stations are just a few steps away from the Schweizerhof Hotel. The Hotel Ambassador Zermatt enjoys a central location, only 100 m from the Zermatt train station and the Gornergrat rack railway station. It offers a large heated indoor pool, whirlpool, sauna and free high-speed WiFi in all areas. All rooms and apartments feature a balcony offering panoramic views of the surrounding mountains, including the Matterhorn. There is a free internet corner next to the lobby, and a ski rental shop is on site as well. Fine Swiss and international cuisine can be enjoyed in the Chi-Ba-Bou restaurant. The lounge and the bar are inviting places to spend some relaxing hours with a selection of drinks. Although the Antika hotel is situated only 100 m from Zermatt’s church and the main street (Bahnhofstrasse), it enjoys very quiet surroundings. The cable cars are only a 5-minute walk away. All rooms are en suite and feature a cable TV and a balcony. South-facing rooms offer superb views of the Matterhorn. Rates include the buffet breakfast, access to the wellness area (sauna, steam bath, whirlpool and relaxation room) and internet access. The lounge of the Antika hotel invites you to unwind with your favourite drink in front of the fireplace. Nearly 100 lifts access more than 400km of runs, including some of the best lift-served off piste in the Alps. The slopes are snowsure and the scenery spectacular, and from the top of the ski area – Mont Fort, at 3,330m – the views reach as far as the Matterhorn and Mont Blanc. The challenging terrain on Verbier’s doorstep has given rise to thrilling spectator events, from Xtreme Verbier (the finals of the Freeride World Tour) and the Verbier High Five (at which amateur skiers compete alongside world champions), to the Patrouille des Glaciers, a gruelling ski touring race from Zermatt. Thanks to the altitude of the ski area and the extensive snowmaking, it’s pretty safe to book early or late in the season. From the resort at 1,500m, heights of more than 2,700m can be reached by two consecutive gondola rides that take under 11 minutes in total. There, the high altitude guarantees abundant snow. In general, the shops, restaurants and hotels are concentrated in a relatively small area of the resort, the streets leading off Place Centrale and up to the main gondola at Médran, 500m away. It’s a 10-minute walk from end to end. A regular free shuttle bus links the Médran gondola with the lifts for the other, smaller ski areas via different routes among the chalets – it also provides the majority of people with access to the central area and its slopes. The recent opening of two long-awaited lift connections has made it much easier to explore the whole of the 4 Valleys. One accesses the heart of the Bruson ski area, formerly an insider’s secret among locals; now it’s just two seamless gondola rides from Verbier. A second high-speed gondola has transformed the link between the 4 Valleys resorts of Siviez and Nendaz. Visit Verbier for the great terrain, the cosmopolitan atmosphere, the wild natural landscape and all the attractions of French-speaking Switzerland – Swiss precision, quality and reliability, twinned with Mediterranean charm and a love of the good things in life. Situated on the central square of Verbier close to the shops, restaurants and ski lifts, Hote Bristol offers you free WiFi in the entire building and a breakfast room with panoramic views of the Combin Mountain Range. All rooms feature period pieces of furniture and from the windows you can enjoy views of the Swiss Alps. Each of them is equipped with a minibar and tea and coffee making facilities. The ski lift Le Moulins and Ski Lift Verbier – Croix des Ruinettes I are 400 m from Bristol Hotel Verbier. The up market Hotel Vanessa is one of the best hotels in Verbier. It is in an enviable location 200m from the lifts and just off the central square. The lifts are just a short 5 minutes’ walk away. It offers free Wi-Fi and free garage parking. All rooms have a balcony overlooking the Alps. You have free access to the Hotel Vanessa’s hot tub and sauna. All rooms are spacious, bright and quiet. Some feature a flat-screen TV and a DVD player. Fine traditional cuisine and a wide range of drinks are served in the restaurant and in the bar of the Hotel Vanessa. Luxurious ski in ski out hotel offering stunning and spacious guest rooms, suites and residences with amazing views. W Verbier is a luxurious house in the modern centre of Verbier, boasting a spa area with indoor pool and heated outdoor pool. The hotel is located directly next to the Verbier Cable Car. Each room features a balcony, a flat-screen TV, a coffee machine and a bathroom with shower or bathtub. Breakfast is served every morning and guests can enjoy dinner at the Arola Restaurant, serving Mediterranean and traditional Alpine cuisine. W Verbier also features a Tapas Bar and a café on site. A shuttle service to Geneva Airport, a 2-hour drive away, is available on request. For stunning views from the resort and the slopes, there are few places to rival Grindelwald. The main access lifts are slow but traditional Swiss, taking half an hour to ride even if you don’t have to queue (for the gondola) or wait (for the train). Grindelwald regulars accept all this as part of the scene. Wengen is one of three resorts close together in the Jungfrau region (together with Grindelwald and Murren). Given the charm of the village, the friendliness of the locals and the drama of the scenery, it’s easy to see why many people love Wengen. It’s great for a relaxing time, for those who don’t take their skiing too seriously, for families and for mixed groups of intermediates and non-skiers. The spectacularly scenic Jungfrau region is one that every keen skier should experience, and to experience all of it, Wengen – centrally placed between Mürren and Grindelwald – is the best base. Wengen is set on a sloping shelf above the Lauterbrunnen valley, opposite Mürren, and reached only by a cog railway, which carries on up to Kleine Scheidegg and the slopes shared with Grindelwald. The Jungfrau lift pass covers all three resorts. staying here you will enjoy some of the most spectacular scenery in the Alps, a small, traditional, nearly traffic-free Alpine village and lots of long, gentle runs, ideal for leisurely intermediates. This is one of our favourites and has been used by Estours travel for its ski groups since 1983. The Derby Swiss Quality Hotel is a 3-star superior hotel located right at the train station in the very center of Grindelwald and features a familiar atmosphere and delicious Swiss cuisine. Choose from fully-equipped, alpine-style rooms and start the day with a rich buffet breakfast. The sauna and the solarium invite you to unwind after a day out in the fresh mountain air. The dining room seats 80 guests and serves a 5-course menu to guests who booked half-board. The Gaststube is a local pub with a cozy atmosphere, where hotel guests and locals meet to drink beer or wine and have some snacks. The Föhrenstube Restaurant serves individual options of traditional Bernese cuisine and international specialties. Wireless internet is available free of charge throughout the entire property. The 4-star hotel Wengener Hof in car-free Wengen is one of the most traditional hotels in Wengen. The hotel is surrounded by the impressive mountain world of the Bernese Oberland, right at the foot of the Jungfrau and the Jungfraujoch – Top of Europe. The hotel with extensive gardens has an exceptional view to the Jungfrau mountain, over the Breithorn mountain chain down into the Lauterbrunnen Valley. This traditional hotel was built in 1898 and is extremely popular with returning visitors that value the calmness and charm of this house. Because of its excellent location and pleasant scale of 65 beds the Wengener Hof offers a consistently high standard of hospitality (4 stars) and is known for its personalized service for many years. The kitchen and unique Bordeaux wine selection offer enjoyment and hospitality based on a high standard. Indulge yourself. Davos is a small Swiss town with an international appeal that has always extended beyond its own ski slopes and those of the Parsenn ski area that it shares with neighbouring Klosters. Davos wasn’t built as a ski resort and it is no architectural beauty, but then you haven’t come here to admire the solid and largely unenterprising blocks of hotels. Your Davos Regional ski pass allows you to ski in the 6 different ski areas of Rinerhorn, Parson, Jakobshorn, Pischa, Madrissa and of course Klosters, with some extremely long runs to either Klosters or Kublis. The town is divided into two parts: Davos Platz and Davos Dorf. Platz is most convenient for the majority of hotels and shops. Dorf is the best base for accessing the slopes. However there’s an efficient ski bus service and getting from one to the other presents little problem during the day and early evening. The majority of the accommodation is comprised of four- and five-star hotels. If you like the sound of the mountains around Davos but don’t like the look of Davos itself, here’s your solution, Klosters. It is a more traditional-style village with equally good access to the same ski areas. Klosters is a sizeable village with a relaxed, affluent Alpine atmosphere. Another one of our favourite hotels used by Estours ski groups for many years. The family-run Club Hotel Davos enjoys a quiet location at the southern entrance to Davos Platz, 300 m from the centre and 500 m from the Jakobshornbahn Cable Car. It includes an indoor pool and various saunas, and free Wi-Fi is available. Rooms at the Davos Clubhotel are furnished in a classic Alpine style and feature a TV and a bathroom with a bath and a hairdryer. The restaurant serves a traditional Swiss breakfast buffet and 4-course dinners for half-board. There is also a hotel bar. Guests can play table tennis and use the pool and an internet terminal free of charge. The bus to all ski areas and the Congress Centre stops in front of the hotel. This traditional Swiss hotel boasts natural charm and character – open all year long. The 3-star Hotel Steinbock is centrally located at the heart of Klosters and offers spectacular views over the mountain landscape. The rustically furnished rooms offer style, comfort and space to relax in. The hotel chefs wow their guests with culinary Grisons specialties and classic Swiss delights. The Steinbock is a friendly hotel with attentive service and personal atmosphere in a very central location in the heart of Klosters, only a 5-minute walk from the mountain railway. Surrounded by a breathtaking mountain landscape, the hotel offers comfortable and modern rooms (disabled rooms are available as well), a terrace and tastefully and rustically furnished restaurants with an excellent cuisine. All our guests receive a guest card offering many reductions and free services, including the local buses in Klosters and Davos and the Rhaetian Railway from Klosters to Davos. St Moritz remains the best all-round wintersports resort in the world, boasting a myriad of on and off-snow activities. Its famous frozen lake is the setting each winter for skating, curling, golf, polo, horse racing, show jumping, and even cricket. The resort’s bob run is the last remaining natural course in the world, while the Cresta is the original and infamously men-only home of skeleton – women are still not allowed to compete on the course. 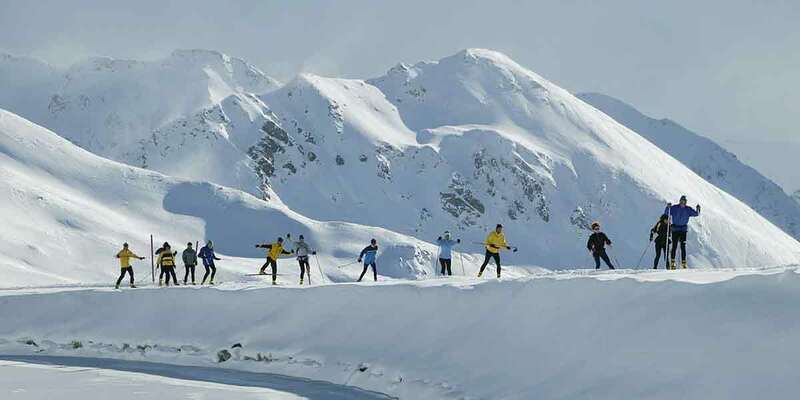 In March, St Moritz hosts the Engadin Skimarathon, Switzerland’s largest cross-country race with as many as 13,000 entrants. The resort is the world capital of winter glitz and attracts a clientele with the kind of stratospheric incomes only otherwise found in the famed hangouts of the rich and richer, Courchevel, Megève or Vail. Walking down the street here in high season, it would seem that Prada and Bogner are the sole manufacturers of ski wear and that mink fur coats are mandatory. But there’s more to the resort than bling. St Moritz’s position at 1,856m in the Engadin Valley in the south of Switzerland, close to the frontier with Italy, gives it a rare combination of snow reliability and 300 sunshine days each year. Plus, its ski area is excellent, especially for intermediates. It has 58 lifts and 350km of pistes and is divided into four separate sectors. The bottom lift is at 1,800m and the top of the ski area at 3,305m. Dorf, on the shore of the lake, is the glitzy area with most of the five- and four-star hotels as well as the pick of shops, nightlife, and restaurants. St Moritz Bad is less than 2km – a four-minute drive – away, and an altogether quieter and less showy location. Celerina, 3km away on the other side of Dorf, also has its share of sumptuous hotels. Its strong Italian following has earned it the name of Piccolo Milano (Little Milan). All three link by lift into the core of the ski area at Corviglia at 2,486m. The 4-star Art Boutique Hotel Monopol in the heart of St. Moritz stands for the unforgettable pleasure of living in style and comfort. In the middle of St. Moritz’s pedestrian area with its designer and luxury boutiques, it is just a 2 minute walk to the Chantarella mountain railway. It features a top-floor spa area offering panoramic views. All rooms feature a flat-screen TV, a minibar, and a bathroom with bathrobes and slippers. Free WiFi is available in all areas. The Monopol Hotel’s spa area on the 6th floor includes a fitness room, various saunas, showers, massage jets and a hot tub. Authentic Italian cuisine and a wide range of wines are served in the Mono Restaurant. There is a lobby bar and the Wellavista Bar with a rooftop terrace overlooking the mountains and Lake St. Moritz. During winter season, ski passes are available at reduced rates at the hotel for stays of more than 1 night. Overlooking Lake St. Moritz and the Swiss Alps, the classic Carlton Hotel built in 1913 enjoys a prime location. It houses the gourmet restaurant Da Vittorio-St.Moritz as well as a 3-floor spa area and offers a 24-hour Bentley limousine service within St. Moritz. The spacious junior suites and suites are at least 35 m² in size and all offer panoramic mountain and lake views. They are decorated with luxurious fabrics and feature soft armchairs and sofas and a large bathroom. A butler service is available. The Da Vittorio – St. Moritz restaurant is led by the 2 brothers Enrico and Robert Cerea who have been awarded 1 Michelin star and 18 Gault&Milau Points. Their restaurant Da Vittorio in Brusaporto was awarded 3 Michelin stars. The Lounge & Bar has 2 cosy fireplaces and a sun terrace overlooking the lake and mountains where you can sample the Carlton High Tea or coffee specialities.